Club of America in celebration of an amazing automobile company and a wonderful motor car. The site will of course, contain a registry of known surviving cars, history on the Cole Motor Car Company, and a ongoing blog that will post stories, information, news, historical data, documents, and other useful information related to the Cole motor car. With the registry, we will not publish any personal information without permission of owners. Leroy Cole, former leader of the Cole Club of America has helped us with launching this and has been very gracious in the sharing of information, history, and documents. Leroy Cole states that “I am so happy that the registry continues through the Fleck team of Kevin and Ben. the hopes and goals of our early beginnings continue in them”. We cannot thank Leroy enough! Now for the story of our entre’ into the world of Cole automobiles! crazy and information was not easy to obtain. We were able to find Leroy Cole, the leader of the now ended Cole Motor Car Club of America. Leroy was very kind and shared lots of amazing information and stories. My son and I built a friendship with Leroy and vowed to carry on his and others amazing work of the Cole Registry and sharing the Cole information and stories. 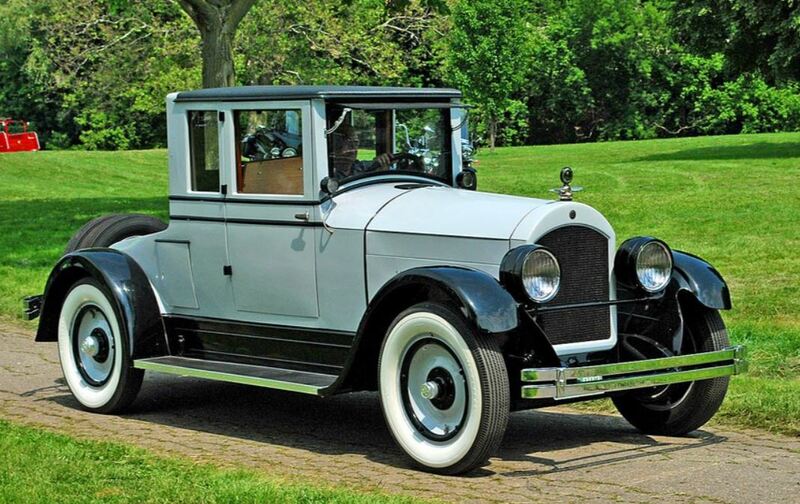 We loved taking the 1913 Cole to shows and sharing the car and history with others. We now own a 1923 2 person Coupe as well. We each have our own Coles now and will probably add more in the future. Mayo German Silver Radiator, Stromberg carb, Spicer U Joints, Firestone tires and detachable rims, Timken axles, Gemmer steering, and an automatic Taylor Tire pump. The Delco full electrical system was used two years before Charles Kettering received his patent at Delco in 1915. Many of the other components included were first of or very early uses in a production car. Owning this car has been a great time and we have taken it to many shows including the 2018 Concours d’Elegance of America at St. Johns. Person Coupe that was built by JJ Cole for his son JJ Cole jr.. It is car number 68857. Ben acquired this car from Leroy Cole and is the third caretaker of the car since it was produced. The car was built in 1922 as a test car for Cole’s balloon tires which were pioneering in the auto industry. The car also tested 4 wheel brakes and a multi disk transmission. The car has an 80HP V8 engine and is considered a Full Classic by the CCCA. The car is currently on loan to the Gilmore Car Museum for display. Both Ben and I look forward to trying to answer any questions that you may have and to network with others about Cole Motor Company cars and history.